How to do Blu-ray to QuickTime conversion on Mac? 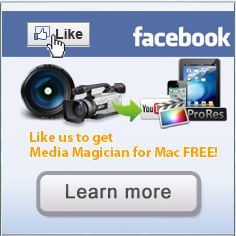 Home » How to do Blu-ray to QuickTime conversion on Mac? 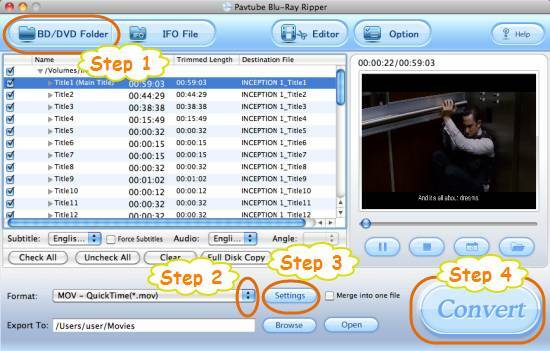 Pavtube Mac Blu-ray to MOV converter is the professional tool designed for Mac users to do Blu-ray to QuickTime conversion on Mac. It is capable of converting bluray to MOV/HD MOV format, so that you can enjoy HD Blu-ray movies with QuickTime player, or edit them in Final Cut Pro/Express on your Mac conveniently without any trouble. You can convert the latest released bluray to MOV at will. Go to see a detailed guide on how to convert bluray to QuickTime on Mac in the following contents. Run Pavtube Mac Blu-ray to MOV converter, and then click “BD/DVD Folder” to load bluray movie files. To do Blu-ray to QuickTime conversion on Mac, you need select QuickTime as output format. Click on the dropdown menu of “Format”, and then follow “Common Video” > “MOV – QuickTime (*.mov)”. The Blu-ray to MOV Converter for Mac allows users adjusting video and audio parameters before converting bluray to mov. Click “Settings” button, then you will be able to adjust video and audio settings in the following popup window, including codec name, aspect ratio, bit rate, frame rate, sample rate and audio channel. When the above mentioned steps are finished, you can press the big button “Convert” to start converting bluray to MOV. The Blu-ray to MOV Converter for Mac adopts advanced audio and video in sync technology, which will guarantee you perfect audio and video synchronization. Once the conversion is done, you can click “Open” button to get the final output QuickTime files with ease.